It’s always a horrific thing seeing pictures like these, especially when it looks like a brutal end portrayed in the photograph is just inescapable. After a little bit of research, however, I found out that there was a happier ending to this particular image. Depicted is Lt. Walter Lewis Chewning stepping on a ruptured and already-ignited fuel tank of an F6F-3 Hellcat, piloted by Ensign Byron Milton Johnson on the 10th of November, 1943. Chewning was able to retrieve Johnson from his stricken aircraft as it went up in flames, saving his life from a fiery early end. The Big E was enroute to the Gilberts to support the invasion at Makin, which occurred ten days after this photograph was taken. On the 10th, Johnson went up for a training exercise and found his engine responding poorly. After requesting an emergency landing, he was waved off thrice because he was unable to maintain control of the stricken Hellcat. Finally, he snagged the 3-wire during a very rough final attempt, ramming the underside of the plane onto the deck and rupturing the belly drop tank as he skidded to a stop near a gun-put. The crash-landing jammed the cockpit closed, just as the fuel ignited from sparks cause by the propellers. 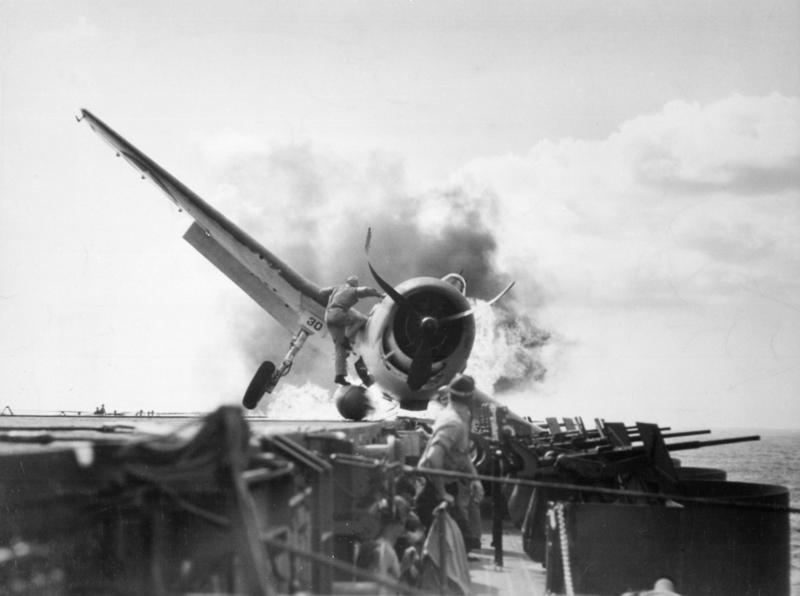 Lt. Chewning, the ship’s catapult officer, climbed out of the catwalk and ran through the smoke, jumped on the tank and forced open the canopy with a mighty effort. He pulled Johnson to safety while the Hellcat lit up. Chewning was awarded the Navy and Marine Corps Medal for his actions. The CAG of VF-2’s Air Group, Butch O’Hare issued a recommendation that all night sortie pilots ditch their drop tank before entering the landing pattern to keep such an event from happening again. Chewning remained in the Navy, reaching the rank of Lieutenant Commander and eventually passing away in 1990. Johnson also stayed in the Navy, going on to become a fighter ace with VF-2, credited with 8 confirmed kills over Iwo Jima, before leaving the service for a quiet civilian life. He passed away in 2005.